Wearing technology or technology wearing you? Your clothes will soon become accessories for your gadgets, say fashion and technology experts. The technology will be so much a part of you and your clothing, the outside world might not even know it is there though. But there are many design challenges for fashion and engineers if they want people to wear technology. One thing is certain, you will not have to resemble the Borg from Star Trek if you do not want to. With gadgets and technologies playing an increasingly important part in how people organise their lives, carrying them is a must. Powerful processors have made mobile phones more like pocket computers and allow people to do a lot more with them. Wearing this computing power inconspicuously would make life easier, according to fashion specialists, technologists and engineers who gathered in Birmingham last week for a wearable computing conference. Muttering into a wire plugged into a mobile phone is a familiar, yet still quite disconcerting sight and for years headphones have been used to listen to music whilst strolling or jogging. 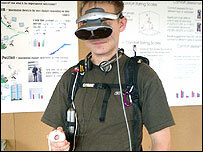 Bluetooth headsets can clip onto the ear and allow a wireless connection to your mobile and headsets with tiny screens attached to glasses allow wearers to see a computer screen. But for most, this is about as far as wearable technology goes and for many, it is still too conspicuous, expensive, and unnecessary. "Wearable computing can mean anything from a cell phone to a large computer in a backpack. But right now they are very visible and obvious with wires, headsets and twiddlers," said Joseph Dvorak, who works in research and development at Motorola US. "Things are changing as phones and PDAs all get smaller and smaller. Speech is also becoming more reliable so keypads and the visible stuff is being replaced." Mr Dvorak predicts the computers and technology we wear in four or five years time will not draw attention to ourselves. "It should blend with your tastes. 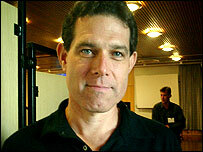 Different people will be comfortable with different types of fashion," he told BBC News Online. "But it should simply blend in with and enhance your own sense of taste so that you'll want to wear it. And you may not want anybody else to see it." Some designers are experimenting with putting wires and electronics in their clothes. Most examples of these are purely for the high-fashion catwalk, one-off concept pieces designed to look good rather than do anything. Access to the technologies is a problem for designers too, and there is a gulf between the fashion industry, technologists and engineers in the thinking around wearable technology and computing. Much of it does not make it out of the engineer's lab or off the fashion designer's sketch pad. 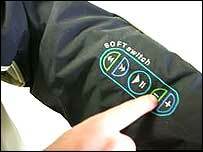 Textile company Softswitch has gone some way to developing useful and wearable computing. They have created textiles which act as interfaces to control any type of electronic device. In January, the Burton Amp jacket, what is described as "the world's first and only wearable electronic jacket with an integrated Apple iPod" went on sale using Softswitch's technology. Aimed at snowboarders and skiers, it was designed so that the iPod music player could be controlled from a flexible control pad embedded into the jacket's arm. "What we've done different is that it is textile-based. We are not just building a pocket to house MP3 player," said Dr Dianne Jones from Softswitch. In October, their technology will be used in a full "telecoms jacket" manufactured by a well-known brand. 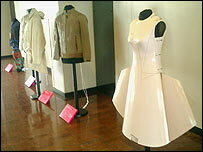 The jacket will use ribbons and textile cable to carry audio signals to earphones in order to operate a mobile phone. Dr Jones expects the wearable computing industry to grow and be increasingly important in the coming year as more computers come out of their plastic boxes and into clothing. She is confident there will be much more interested from the fashion industry to get involved in the design of such wearable computing too. "I think within the next five years we'll see a lot more applications coming through, but it can be simply a garment that has basic electronic capability or interactivity." "Certainly within the next 10 years we could see 20% of garments with electronic components in them."